CES is like any trade show in that exhibitors will do almost anything to get attention, and that include sometimes having a cut or fun looking thumb drive. I've seen press kits in thumb drives which look like vehicles, have wood shells, or look like cartoon characters (Vivitar has a Hello Kitty thumb drive this year). But one company stood out from the crowd. 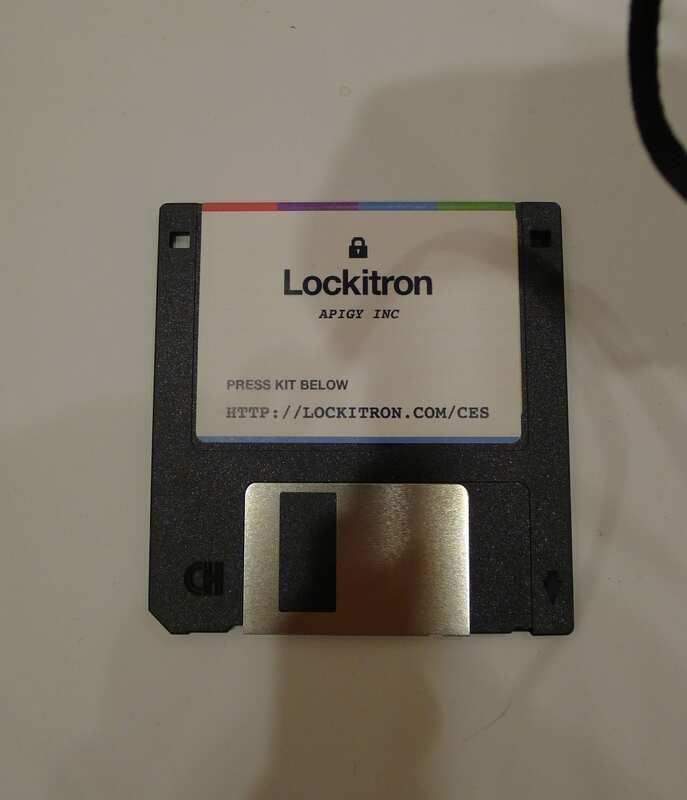 The picture at right doesn't show a USB thumb drive disguised as a 3.5" floppy; that disc is a really 3.5" floppy. I'm told that one of the support staff tested it and it actually does have a press kit on it. I can't for the life of me figure out where the exhibitor found a company to burn the discs with the press kits but somehow they did. My hat is off to them. Anybody still have a floppy drive installed? I’ve got one in a box somewhere, I think. My thought, as well. The idea is too clever by half. I have a USB floppy in a box somewhere. I can’t tell you the year in which I last used it. 2006? It is a combo floppy and PCMCIA card reader I have in my server PC. As a public library, we had to specify floppy drives when we bought new computers (admittedly, this was 5+ years ago that these computers were purchased), in addition to the DVD burners and USB ports. Too many computer users in our area depended on them, and we are one of the few places in the area where someone can still use those coaster-sized 3.5″ disks today. Yes, they still work on all the public computers, better than some of the DVD drives! I remember back in the 80’s when the 3.5″ disk came out when I was working for Radio Shack and it was available for the Tandy 1000’s (I forget which model was first) and it was a huge deal because it could store so much more than the 5 1/4 floppys and was better protected for carrying around. My how times have changed. I still have a model 100 that still works. The first portable computer that Radio Shack carried. It has a pretty decent defender-like game which is all I ever did with it.